This bear was found at a local thrift shop in Lomita Village San Diego, California 2017. upon inspection we realized this was no ordinary doll. A small card attached to the artifact list this item as a memory bear for Donald Lewis presented by Sharp HospiceCare of San Diego. Memory bears or dolls are created the Sharp HospiceCare Memory Bear Program. 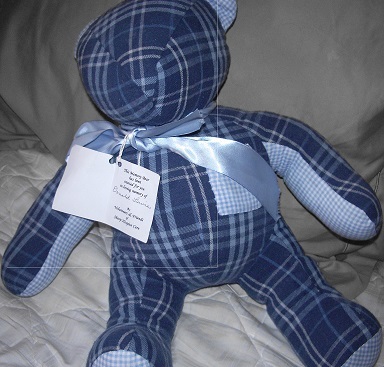 Families provide cherished garments — a favorite blouse, shirt or pajamas that belonged to a loved one — which is then sewn into a handmade memory bear. These cuddly bears symbolize a special memory that you can hold close to your heart forever.